While I normally post about historical maps, the creations of young cartographer Eric Brightwell that come from his studio “Pendersleigh and Sons” give an understanding of the city that goes beyond geographical and rests perfectly balanced atop the line between art and map-making. Eric’s maps are certainly fun to look at, but they are also true to the landscapes he draws—due in large part to the fact that he takes after the great cartographers of old and looks at the land on a close-up and personal level. Eric walks the ground he draws step by step and then creates a big picture conclusion that gives an understanding most road atlases can’t touch. He has done this all over the southland, creating an archive that describes L.A. just as well as any book or map I have seen. You won’t see any of those areas on Brightwell’s map, where he details hidden delights east of the L.A. River and shows us communities within the community like Rose Hill, Happy Valley, Hazard, Hillside Village, Maravilla and the “Auto Glass District” (which you could not possibly know about from viewing a simple satellite image). “Whittier” is the famed boulevard and Arroyo Seco is the dry wash east of the river (not the Pasadena pretender). 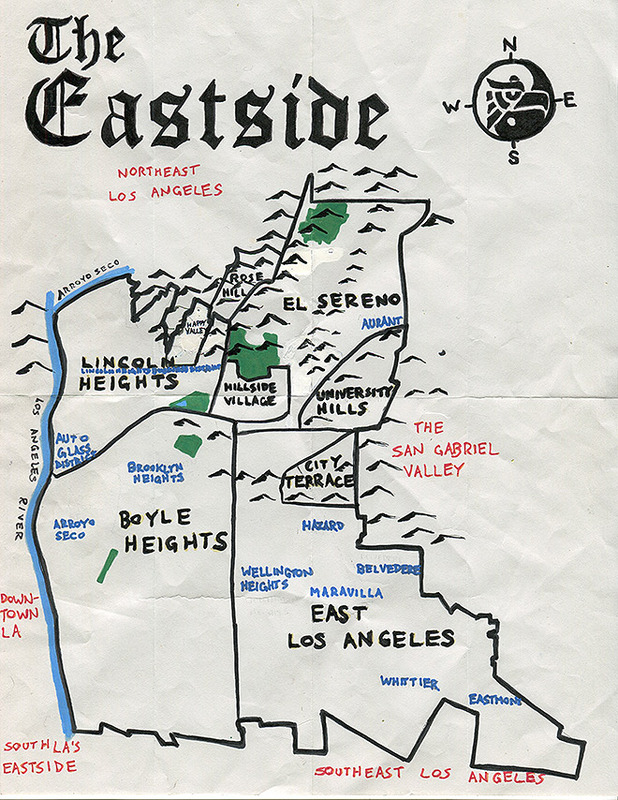 To truly appreciate the scope of Eric’s cartographic wanderings, you really have to check out his site Pendersleigh & Sons Cartography, where cartographic L.A. awaits in living color.